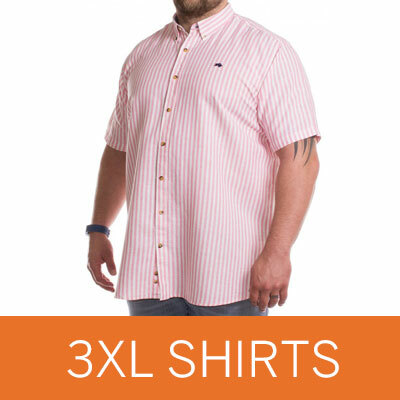 Here at Big Dude, we have a fantastic range of big men’s clothes and have plenty of wardrobe essentials in 3XL. Whether you are looking for a jumper, hoody, T-shirt, a decent pair of jeans or some new underwear, our XXXL clothing range covers the basics and then some. 3XL is one of our most popular sizes and we are always working hard to ensure that we always have a great choice of well-known brands including plus size favourites like D555 and Espionage. Unfortunately, some sites have low stock levels for items that come in larger sizes, but at Big Dude, we are always trying to maintain good stock levels so shopping is easy and fuss free. 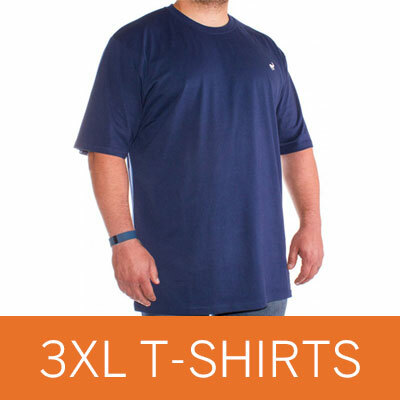 Take a look at our range of XXXL clothing below and check back regularly for exclusive online offers and keep up to date with our new clothing collections being added all the time. At Big Dude, we pride ourselves on our fantastic range of XXXL shirts available - No matter the occasion, we have the shirt to suit. Our formal long sleeve shirts are perfect for weddings or if you really want to impress, go one step further with our 3XL dress shirts. These Double Two brand white shirts pair perfectly with a tuxedo and are a must for a formal evening events. On the other hand, we also have over 100 short sleeve casual shirts, that are ideal for the warmer Spring and Summer months. Whether you’re after a bright Hawaiian shirt or a casual piece to wear out with friends we have plenty 3XL short sleeve shirts available for the larger man. Big Dude have an ever growing selection of T-shirts in size 3XL, so whether you are looking for a classic plain white tee or want a printed top to pair with jeans for a casual look, we have the perfect T-shirt in stock. Most of our 3XL T-shirts are 100% cotton, but poly-cotton mix is proving to be a big hit due to its durability and softness. With famous big name brands like Kangol and Slazenger providing 3XL size T-shirts, as well as premium brands like Santa Monica, Raging Bull and Lambretta, our XXXL size T-shirts prove to be very popular and one of our best selling items. 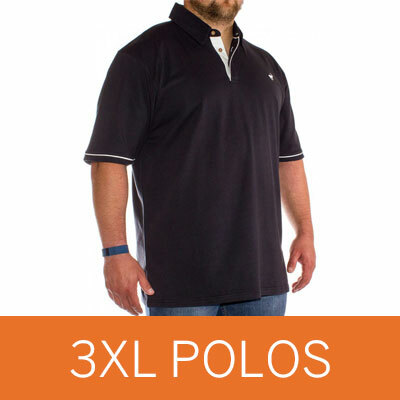 We have a fantastic range of polo shirts at Big Dude, with over 150 styles to choose from. Our 3XL polo shirts are available in both long and short sleeve varieties and with a number of colours and brands to choose from, you’ll be spoilt for choice. Check out the range of Mish Mash and Raging Bull polo shirts for premium quality pieces with interesting details as well as our very own Big Dude collection. If you are looking for an extra layer to add when it’s getting a bit chilly, take a look at our range of 3XL jumpers and hoodies for a fantastic selection of warm and stylish pieces. Our collection covers everything from XXXL hoodies, cardigans, big jumpers or tracksuit tops in a variety of colours and styles. Our 3XL hoodies are very popular amongst our customers as they are excellent value, backed by our price promise, fantastic quality and from some of the biggest brands including D555, Kangol and Awdis. Our big suits have been a real hit and with prices from just £99, we can see why. Our XXXL suits are perfect for those formal occasions and come in a range of popular colours including navy, charcoal and grey. We are constantly expanding our suits collection and have also started introducing more casual blazers as well as waistcoats, which are perfect for matching with suits at more formal occasions. For the perfect fit, we offer you the option to order your suit jacket and trousers individually and mix and match for a more individual style. If you’re after a great pair of 3XL shorts, Big Dude have a fantastic selection of over 100 styles for you to browse. Including comfortable jogger shorts, casual cargos and bright swim shorts from as little as £7.99, our XXXL shorts are great value, come in a broad range of styles and with brands like Cotton Valley, D555, Loyalty & Faith as well as Kangol, you don’t need to shop anywhere else! Whether you are after a big winter coat or a light summer jacket, Big Dude can help - We stock a fantastic range of XXXL jackets, coats, gilets and more so you have no excuse to get cold! Generally, we change our coats and jackets with the seasons, stocking light weight cagoules in summer and bulky bomber jackets in winter, but fleeces and gilets are steadily available all year around. Check out our waterproof jackets for those wet weekends away and browse our popular brands including the well-known outdoor specialist Regatta. Comfortable, easy to wear and great for lounging in, our joggers have always been a really popular item here at Big Dude. We stock 3XL joggers from famous brands like Slazenger, Kangol and Kings Club in a range of colours including navy, grey and black, so whether you’re after a pair with cuffed hems or prefer an open leg, if you are after a comfortable pair of 3XL joggers, take a look at what Big Dude has to offer. Whether you prefer Y-fronts, trunks, boxers or briefs, browse our selection of underwear, perfect for the XXXL man and choose between brands such as the award winning Jockey, KAM, Duke, Ed Baxter and many others. Cotton, spandex and Lycra underwear is available in a range of popular colours such as black, white, navy and grey, so if you are looking for some new undies, take a look.